Nai’ka can’t beat faeries, it’s like a rock paper scissors thing. I got an email saying my charms have shipped so hopefully I’ll have them in hand in the next few days. Also that roleplay forum is in the process of getting set up, though I’m a little worried that everyone just wants a generic TF2 roleplay, which isn’t what I wanted to run. If you’re interested in the urban fantasy end of things please consider joining up. What a little cutie. I wanna wrap him in a blanket next to a fireplace and drink hot chocolate with him. akimbo 9mms? what the hell gabry, did you learn all your gunplay from TV and videogames? one gun, both hands, keep your damn aim steady! really i’m more disappointed in Liam for not teaching him. 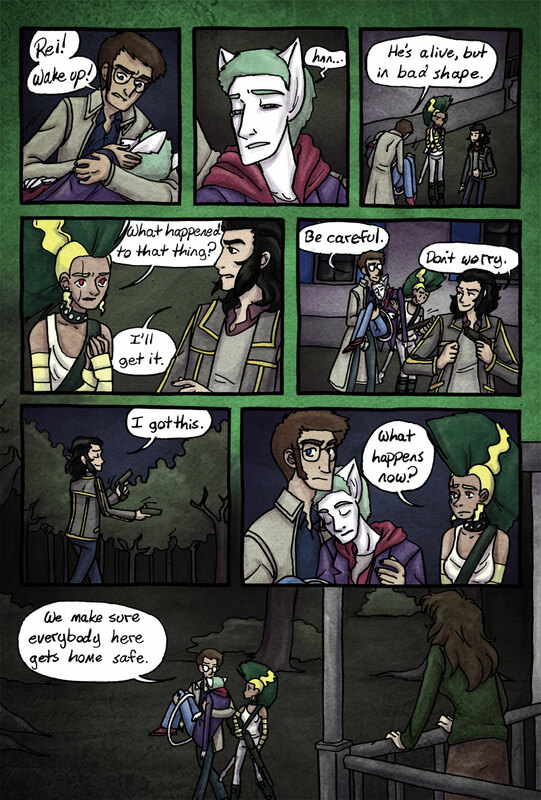 i like the body language in this page, Gabry is stupidly confident. Have to say, this comic is very good! I love the art and the story is well thought out and detailed! You’ve grown a lot as an artist since cuanta vida. But I gotta admit, the dialogue feels a little off here and there… I don’t want to flame but simply give some constructive criticism (which probably not everyone will agree with but still). I\’m always open to constructive criticism, but can you be any more specific? When you say the dialogue feels off here and there there\’s no reliable way for me to tell which lines you\’re talking about and in what way they\’re bad. If I can\’t identify the problem I can\’t decide if I agree with you, let alone try to fix it. I find that when people talk about dialogue being “off”, they’re often subconsciously reacting to grammatical problems.